Well, looks like I'm doing this now. Constructicon Scrapmetal combines with his comrades to form Constructicon Devastator. So yeah, Transformers Studio Series is doing Devastator. Revenge of the Fallen Devastator. The one with the dangly bits. 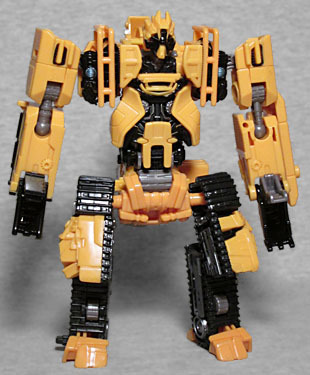 And unlike the big Devastator that came out at the time of the movie, this one is built from Transformers with three modes: robot, vehicle, bodypart. If not for that huge step up, I might have skipped these entirely - even despite my well-documented fondness for Devastator. 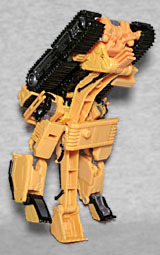 But we're getting actual combiners, so I'm buying in. 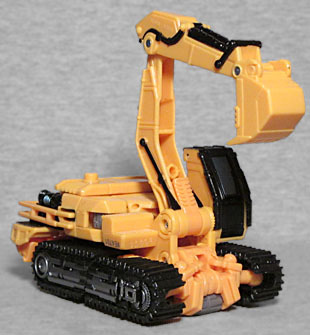 This little guy was not named in the movie - "Scrapmetal" is a fan nickname derived from the fact that, when they went to the Laurentian Abyss, Scalpel directed the other Constructicons to rip "ze little one" apart so his parts could be used to repair Megatron. When Hasbro learned about the fan name, they liked it, and so it became official. "Ze little one" was barely seen in the movie (the bottom of the ocean is fairly dark, after all), so there he just used the same character model as another Constructicon. Since that guy will be getting a toy in this set eventually, Hasbro didn't have the option to cheat that way; so instead, they went back to a piece of concept art to create something new. 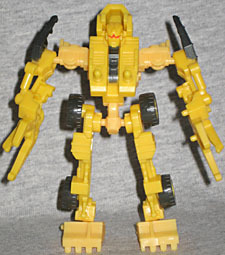 The body is short and very squarish, with blocky arms and a frame running over the shoulders. There are all the usual "Bayformer" design touches, like the animal legs and the weirdly shaped plates of armor on the chest, but even with those accoutrements, this feels a lot like a member of the Robots in Disguise Build team. Scrapmetal moves at the neck, shoulders, elbows, hands, hips, thighs, and knees. The concept art showed him with big pincers in place of hands, but here they're big, scoopy buckets. The way the arms are designed means you'll have to turn the elbows if you want the hands to point any direction other than "palms up," but that's not a major problem. He doesn't get any accessories, per se, though there is a shield that plugs into the forearm (though onestly, it feels more like a "we couldn't find a way to hide this piece in the conversion" artifact than anything real). To convert the robot, fold his hands away, push the shoulders backwards, lower the hips, open the chest to tuck the head away (revealing some pretty neat "spinal" detailing inside), rotate the forearms around to fill in the space behind the back, straighten and rotate the legs, flip them up, and fold his feet into place. Then just put the "shield" piece on to cover up the kibble. 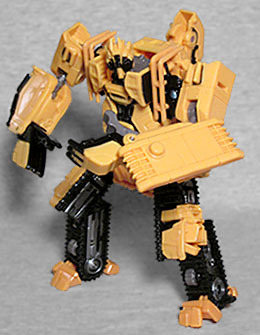 Scrapmetal's altmode is an excavator, which is new to the movie Constructicons, but definitely isn't new to Constructicons as a whole. The vehicle is 3⅝ long, 2⅝ wide, and 2¼" tall at minimum - that's the height of the cab, but the scoop arm is poseable as well, with hinges at the body, the bucket, and in between, so you could either stretch it straight up to the 6½" mark, or stick it straight out to the front and add another 4½" to the overall length. The sculpt is quite realistic, with very little robot kibble visible. 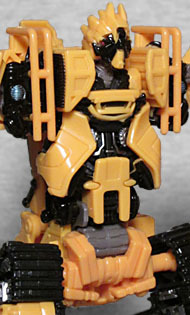 Scrapmetal is yellow and black, taking the place of the little unnamed bulldozer that, in the movie, formed the left hand. Yes, Scrapmetal will be the left hand of the full Devastator - or part of it, at least. 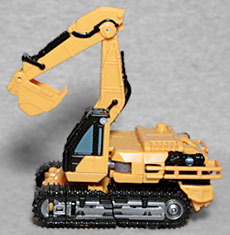 The robot's arms and the excavator's scoop become three big fingers, but you'll need Hightower to provide the thumb. Since this is only part of an appendage, not the whole thing, it doesn't look like much on its own; but surely it will be cooler once some more pieces come out. The hand mode may not be very impressive yet, but luckily, both the robot and the vehicle are. Even if the gestalt ends up disappointing, this one component is just fine.